Overview - Part two of Ayn Rand’s groundbreaking novel comes to the screen in this thrilling and powerful drama. The global economy is on the brink of collapse. Brilliant creators, from artists to industrialists, continue to mysteriously disappear. Dagny Taggart, Vice President in Charge of Operations for Taggart Transcontinental, has discovered what may very well be the answer to a mounting energy crisis - a revolutionary motor that could seemingly power the World. But, the motor is dead... there is no one left to decipher its secret... and, someone is watching. It's a race against the clock to find the inventor before the motor of the World is stopped for good. What do you do when the first installment of a planned film trilogy bombs at the box office and goes on to receive poor reactions from both critics and audiences alike? Well, if you're smart and have any inkling of self awareness, you might do the merciful thing and just let the project die. Simply cut your losses, accept that the experiment was a failure, and move on. If you're the producers of 'Atlas Shrugged,' however, you don't do that. Not by a long shot. No, despite what common sense might dictate, instead you decide to trudge on with a haphazard sequel -- and this time you completely recast all the original actors with even less engaging performers, hire a director mostly known for sitcoms, and throw in a writer whose most impressive credits include three episodes of 'Walker, Texas Ranger.' Now, you might be asking, "How could such a well thought out plan possibly go wrong?" Well, to answer that question I would simply reply, "What the hell is wrong with you?! Did you even read what I just wrote?!" Needless to say, the plan does go wrong. Very wrong. Picking up where the previous film left off, the script continues to follow Ayn Rand's popular but divisive novel about a near future dystopia where collectivist policies are tearing the nation apart. When we last saw railroad entrepreneur Dagny Taggart (Samantha Mathis), she had tracked down a potentially world changing motor that might solve all the globe's energy problems. That is, if she can get it to work. While she hires an engineer to fiddle around with the miracle device, she further develops her burgeoning romance with Henry Rearden (Jason Beghe), the inventor of a revolutionary steel alloy. Together, the pair combats increasingly oppressive government policies, while fellow wealthy businessmen and artists continue to mysteriously disappear. Throughout it all, one question continues to plague the nation's thoughts: Who the hell is John Galt?! Seriously, it's just getting annoying already! You know that old saying, "If it ain't broke, don't fix it?" Well, what if it is broke? Are you supposed to fix it then? Cause, if that's the case, I don't think the producers got that memo. Instead of actually addressing any of the glaring problems found in 'Part I,' the creative team essentially just offers more of the same, which is particularly impressive considering that the entire ensemble has been recast. Despite a brand new set of faces, the mediocrity doesn't skip a single beat, and while the assemblage of bargain-basement actors is decent enough, they ultimately don't leave much of an impression. Hell, even brief appearances by the likes of Alex Mack, Leland Palmer, and the incomparable Biff Tannen do little to elevate the material. And if Biff Tannen can't save your film, then all really is lost. Competent but stilted performances aside, the characters still sound like ideological mouth pieces rather than human beings, and the plotting remains exceedingly clunky. Time passes erratically with no warning, and there's very little drive to any of the redundant subplots. The film just kind of goes in circles until abrupt narrative shortcuts suddenly move the story along. This is perhaps no better evident than in a comically fortuitous third act scene where a random character literally comes out of nowhere to answer almost all of Dagny's lingering questions. It's just lazy writing through and through. Unfortunately, the visuals aren't much better than the scripting. In fact, the movie's heavy reliance on awful chroma key work is quite distracting, and the whole affair ends up looking a lot cheaper than its already lackluster predecessor. Despite reportedly having a larger budget (though there is some conflicting data on that front), none of that extra money shows up on screen. Rather than the true motion picture treatment that the novel purportedly deserves, the film has all the point-and-shoot aesthetic hallmarks of a very mediocre made for TV movie. Even more distressing than all these lofty problems, is just how incredibly dull the runtime is. Very little happens, the emotional storytelling isn't even worthy of a soap opera, and the tiny hints of interesting philosophical content only serve to further frustrate -- teasing the potential for what a worthwhile adaptation of the source material might actually provide. On the upside, the story does manage to be surprisingly accessible to those who haven't seen the previous film. Though, that really only serves to prove just how pointless the first movie was. As was the case with 'Part I,' it's difficult to truly critique 'Atlas Shrugged' without addressing its heavy political content. In my previous review I noted that my own beliefs lean toward a libertarian point of view, so I can sympathize with some of the film's philosophy. However, the key word there is lean, and there are still several aspects of Rand's ideology that don't sit well with me. With that said, like with 'Part I,' my real issues with the movie don't rest with the ideas themselves, but rather with the narrative's extremely poor and unrealistic examination of those ideas. The entire thematic backbone of the script can be summed up as follows: the government is bad, and wealthy individual thinkers and capitalism are good. It's a simplistic and one-sided approach, and despite some potentially intriguing concepts dealing with the value of creativity, the nature of greed, and the importance of personal freedoms, the movie's ultimate message seems very confused and naïve. Originally released back in October to coincide with the 2012 election, the producers apparently thought that the film's political content was somehow worthy of swaying voters by sparking a legitimate dialogue about our current economic struggles. But if you want to sway voters by opening up a dialogue about a political concept, it's probably a good idea to, you know, actually open up a dialogue -- not just create something that panders to an audience that already agrees with your point of view. Much like the first film, the movie presents a wasted opportunity to tackle some complicated issues, and instead of a multifaceted examination, the film just creates a paper thin scenario that's tailor made to prove its own philosophy at the expense of an engaging story. If Fox News produced an under-funded, rushed, amateur movie of the week, it would probably look exactly like 'Atlas Shrugged: Part II.' If that prospect somehow sounds intriguing to you, then by all means check this out. Unfortunately, even ignoring its narrow political view, this simply isn’t a good film. It's not just the "motor of the world" that's broken here; it's the writing and directing. Even though the movie bombed even worse than its predecessor, a third and final installment is somehow still planned. With such paltry viewer interest, you'd think at this point the producers might want to start questioning who they're making it for. My guess? John Galt. I still don't really know who the hell he is, but by now, he's got to be the only person left who cares. 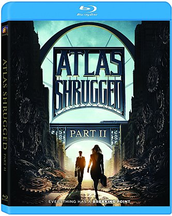 'Atlas Shrugged Part II' is brought to Blu-ray by 20th Century Fox on a single BD-50 disc housed in a keepcase. Some skippable trailers play upon startup before transitioning to a standard menu. The packaging indicates that the release is region A compatible. The movie is provided with a 1080p/AVC MPEG-4 transfer in the 1.78:1 aspect ratio (apparently opened up from its OAR of 2.35:1). With a clean and reasonably sharp picture, the film looks good but unspectacular. Some marginal noise pops up in a few isolated shots, but the digital source is mostly artifact free. With that said, a few of the VFX shots seem to use footage of variable quality (some of the backdrops during Dagny's flight look a lot rougher and lower grade than the majority of the film). Detail is nicely resolved, and though some scenes feature a diffuse softness, the majority of the runtime maintains solid clarity. Colors are natural but a little drab, and with the exception of a richly saturated scene set by a cabin, they seldom pop. Contrast is bright and black levels are steady, but the video is pretty flat in appearance. With its low budget and heavy reliance on subpar chroma key work, 'Atlas Shrugged: Part II' really doesn't look very impressive. From a technical perspective, this transfer is mostly sound, but the decision to change the film's original aspect ratio might displease purists. The movie is presented with an English DTS-HD Master Audio 5.1 track. Subtitle options include English SDH, Spanish, and French. The mix is effective, but there are some notable balance issues. Speech is clear and mostly well prioritized. Unfortunately, the track becomes way too loud during the film's more aggressive scenes. While these lively sequences (including an aerial chase and a train crash) do feature a solid sense of immersion and powerful low frequencies, they are quite unbalanced in comparison to the rest of the muted runtime. This leads to a strong dynamic range, but the sonic disparity between quiet scenes and action set pieces can be annoying. Outside of these overly bombastic moments, the sound design is relatively front loaded, but general ambiance does makes its way around the room with decent directionality and imaging when called for. Though some of the sound design work does successfully offer an enveloping experience, I just wish the audio was balanced better and provided a little more nuance and texture. 20th Century Fox has included a small assortment of supplements, including deleted scenes and a brief featurette. All of the extras are presented in 1080p with Dolby Digital 2.0 sound and no subtitle options. Behind the Scenes of Atlas Shrugged Part II (HD, 9 min) - This is a collection of raw behind-the-scenes footage chronicling the production of one of the film's effects heavy sequences. We get to see the cast and crew work through the practical shots and stunts, and then catch a glimpse of the computer generated VFX work. The finished scene is then shown, putting all the pieces together. Though brief, this is actually pretty interesting. Sean Hannity Extended Segment (SD, 3 min) - Presented in standard definition, here we get an extended look at Sean Hannity and his fellow Fox News pundits debating the merits of Henry Rearden's business philosophy. In other words, this is three minutes of people yelling at each other about fictional political issues. So, it's just Fox News as usual. Sorry, couldn't resist. Deleted Scenes (HD, 15 min) - A collection of excised scenes is viewable together with fifteen chapter breaks. There's a bit more here with Rearden and Dagny's relationship, and some more of Francisco trying to change their minds, but most of this stuff is redundant and inconsequential. 'Atlas Shrugged: Part II' manages to maintain the low bar set by its predecessor. With a poorly written script, amateur direction, and a pedestrian examination of some potentially interesting political and philosophical content, the film plays out like a mediocre made for television adaptation of the novel. The video and audio are solid but not particularly impressive. The small collection of supplements is underwhelming, but the included featurette is decent. Unless you're somehow a big fan of the previous film, this is an easily skippable release.